Situated on the quiet Koh Chang east coast, this elegant 2 storey house for sale is an exciting new addition to the Koh Chang property market. The property is tucked away just metres from the sea in a small and very private housing development, with easy access and parking as needed. The house for sale itself comprises 4 bedrooms, 3 bathrooms, living room and kitchen, all laid out over 2 floors. Each room is fully air-conditioned, while the classical design of tiled floors combined with plenty of fly-screeded windows and doors give the property lots of light and ventilation. Upstairs and downstairs, there are terraces for outdoor seating and those ocean views. 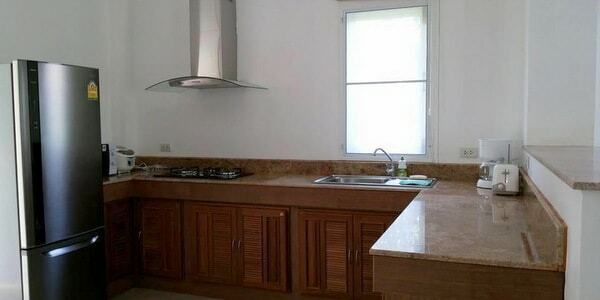 The house is fully furnished with all fixtures and fittings part of the sale. The 4 bedrooms offer king size beds, wardrobes and vanity tables, the sitting room has a wide screen TV as well as sofa beds for extra guests and the kitchen comes fully equipped with large fridge freezer, oven, hob and breakfast bar. The communal swimming pool sits next door to this property so kids can be easily monitored. The red sand local beach is similarly just a few steps away from the house. The house for sale has full Chanote land title deeds and is sold freehold. Currently listed on several bookings sites including booking.com and Airbnb, the house for sale also represents an excellent turnkey holiday let business. There is a management service available on site for the rentals, so changeovers, cleaning and gardening are all taken care of. All in all, this is a premium property ideal for a family or a couple as a holiday home but also a shwred investment opportunity.